J. Hillis Miller is UCI Distinguished Research Professor of Comparative Literature and English at the University of California at Irvine. He is the author of many books and articles on literature and literary theory. His book on Jacques Derrida, For Derrida, is forthcoming in spring 2009 from Fordham University Press. He is currently finishing a book called The Conflagration of Community: Fiction Before and After Auschwitz. This book sets out to provide a new understanding of the nexus between the literary world and contemporary communication (iPhone et al.) in all its facets – not Marshall McLuhan’s “The medium is the message,” but a new formula: “The medium is the maker.” In this exploration of the medium – traditional, modern, postmodern – Miller engages with Browning, Freud, and Derrida to provide a platform of personal discovery and literary enlightenment (at times solemn, ironic, comic, and occasionally devastating). For decades J. Hillis Miller has been one of the best, most influential, and most prolific literary critics writing in English. Always on the cutting edge of his discipline, Miller has in many of his published works defined the location of that edge for his fellow scholars. 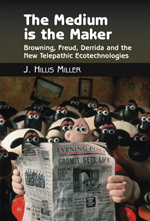 In his new book The Medium is the Maker – Browning, Freud, and the New Telepathic Ecotechnologies, Miller once again takes literary criticism in a fresh and unexpected direction, thinking about the way the most recent communication technologies alter notions of the self, of public and private space, of communication as thought transference, to name only a few of the many issues Miller touches on in this penetrating study. Reading Miller’s criticism is always an intellectually rewarding and exhilarating experience, as any reader of The Medium is the Maker will attest. An eloquent and entertaining audience with the spirits of three famously telepathic texts. J. Hillis Miller lulls the reader to a catastrophic awakening to the forms of telepathic transference haunting the forces of legibility. A rich and rigorous updating of Marshall McLuhan’s ‘The Medium is the Message’ in terms of key theaters of contemporary theoretical deliberation, above all with respect to deconstruction, speech-act theory, and rhetorical reading. A cunning engagement with contemporary media, e-culture, and its implications not just for ‘literature’ but for the epistemo-political orders of life and politics today. This is J. Hillis Miller showing us why telepathy is a phenomenon we can neither accept nor reject, an affront to our rational selves that reveals something about reason itself. An influential and prolific literary critic, Miller attempts to provide a new understanding of the nexus between the literary world and contemporary communication technologies. Examining how these technologies alter (among other things) our notions of the self and of public and private space, the author engages with Browning, Freud and Derrida to provide a platform for personal discovery and literary enlightenment.